Aachi group was established in the year 1995 with a zeal to spread the authentic tang of Indian foods to everyone. We offer various food products ranging from various traditional food masala powders to instant mixes. 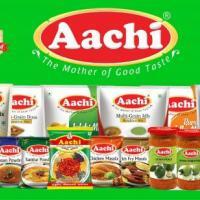 Aachi is renowned for its first-class quality food products. nWe modernize ourselves to meet our consumers requirements. We have been the core of Indian food products since years. Accepted and appreciated by millions of people all across the globe. Every food product in Aachi assures high quality and finest transparency. Our products comprises of rich taste and unique aroma. Aachi brings the traditional food taste to your dwelling. Aachi enriches quality and authentic taste in cuisine. We place immense emphasis on our consumers wellbeing and health, thus ensure in producing hygienic food products.nWe keep on updating ourselves, we keep our promises to deliver best quality food products. Aachi ensures a hallmark of traditional, high quality and unique tasty food products.